One of their optional classes, yoga at Serenity Recovery has a positive impact on patients’ progress in overcoming addiction. The program here centers on healing the individual as a whole, focusing equally on the mind, body, and spirit. Serenity Recovery, a substance abuse treatment center located in Central Michigan that takes a holistic approach to rehabilitation, has produced a new video that focuses on one of the more popular of their optional courses, the Yoga Class. With footage from one of their recent sessions and clips from interviews with a participating patients and the Yoga class instructor, this video is available for viewing on the Serenity Recovery YouTube channel. The art of yoga is described as a physical, mental, and spiritual discipline that involves flexibility, strength, and stamina, meditation and breathing techniques, and a level of self- awareness and inner peace. Originating in India over 2500 years ago, yoga made it’s way into Western civilizations in the late 19th century and reached widespread popularity in the 1980s. Yoga practitioners have been steadily rising in numbers ever since. Cathy Taylor is the Yoga Instructor at Serenity Recovery. In the video, she explains a typical session of her class, which meets twice a week and normally lasts for about an hour. 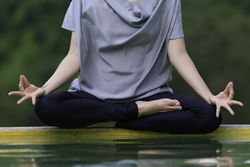 The Serenity Recovery substance abuse rehabilitation program offers many treatment options and supplementary classes, like yoga, for their patients to choose from. They are a results-based recovery center and do not operate on any set timeframe for completion of the individualized program, allowing their patients to explore all of their options to find what will be most effective for them. This creates a sense of self-confidence and an understanding of the responsibility that each holds in their sobriety.